The Glass Den is another find in the increasingly hip Coburg. 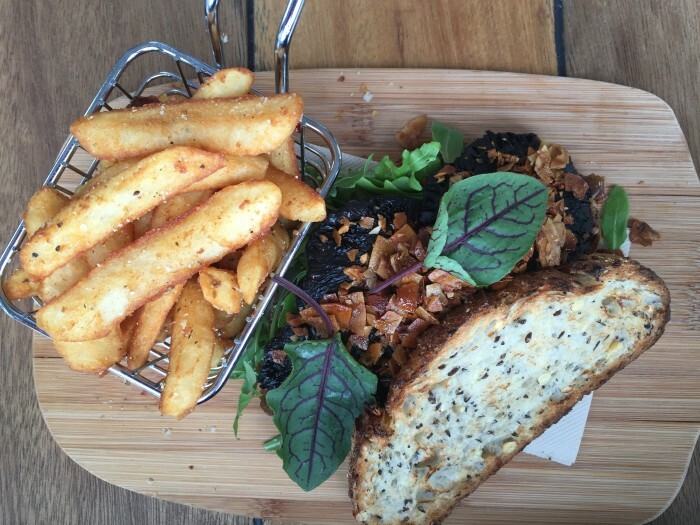 It is a light, airy and bustling cafe that is set in the gatehouse of the old Pentridge prison. It is open for breakfast and lunch. They also did their first Friday night drinks and tapas session recently. I had been planning to go, but a number of events conspired against that. That’s OK as it will be a regular feature. I was also keen to go after two favourable reviews by Where’s the Beef and Veganopoulous. Both of these reviews focussed on breakfast, so I decided to go for lunch for a bit of variety. This is a very vegan friendly cafe. There are lots of vegan or vegan option dishes that are clearly labeled, I counted at least sixteen, so I was spoilt for choice. Coeliacs are well catered for with lots of gluten free choices as well. 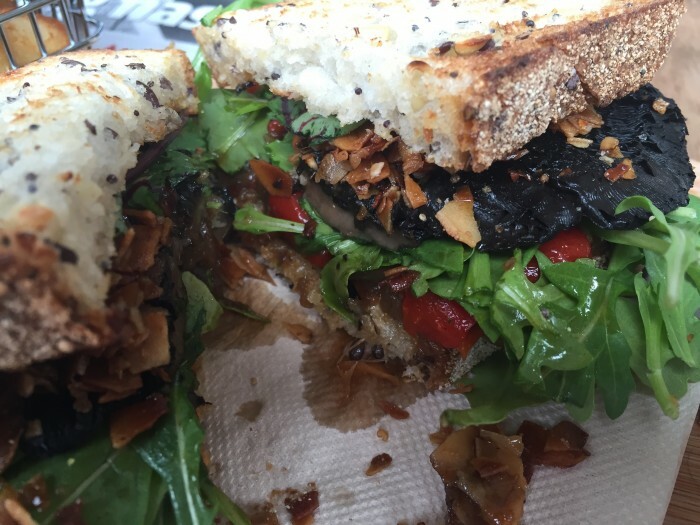 I opted for the Portobello burger, a large roasted mushroom on excellent multigrain bread, with rocket, caramelised onions, capsicum relish and coconut bacon. Large, juicy, messy, and delicious. I also had a side order of chips. Many of the other plates I saw coming by looked good too. I’m keen to go back, both to try other lunch options and also for breakfast. The chips look so good! I’m looking forward to trying their lunch menu.